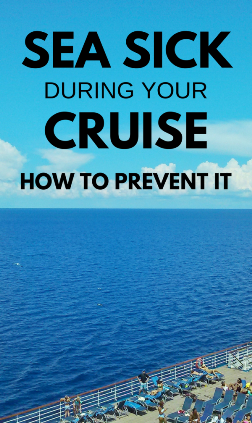 Whether it’s your first cruise or you’ve cruised a few times, getting sea sick is a common concern among cruisers. While there’s no way to completely prevent you from ever getting sea sick, there are a few things that may help you avoid sea sickness. Where you are located on the ship can make a difference in how rocky the ship can feel when the waves are choppy. If the seas are really rough, you may feel the waves no matter where you are on the ship. The locations of these cabins tend to be more limited in feeling the motion of the ship since they are more stable. You can also help to avoid getting sea sick by wearing your remedy! Throughout your cruise, you may see many people with a small circular patch behind their ear. This is in an effort to help prevent sea sickness. These kinds of patches are an option for you to keep your nausea at bay. There are patches like these that say they are completely natural and use herbal treatment to prevent the motion sickness. They also say a single patch can last up to 3 days. There are also wristbands like these and like these that you can wear to help to keep your motion sickness from putting a damper on your cruise vacation. If you have a history of suffering from motion sickness, you might want to take it a step further and have a look at a neck wrap like this. Maybe not technically what you “wear,” but you do put it on you by rubbing it on different parts of your body like your wrists and neck. If you’re a fan of essential oils, give a look to an essential oil blend like this. It’s got a little bit of ginger, peppermint, spearmint, and coconut oils in it! You can also try a couple of the commonly known sea sickness food remedies. And as with all things, you have people who say it does help them and some that say it doesn’t help them. One food that’s been known to help prevent sea sickness is a green apple. Green apples may not work for everyone, but if you’re worried about getting sea sick, there really isn’t any harm in eating an extra apple, right? Not all cruises will have green apples, and if you do find green apples for lunch one day, that doesn’t mean they will also be out for dinner or the next day. So if you see green apples out, take advantage! You might as well eat one even if you feel no effects of being sea sick! In addition to green apples, another common food that’s used to try to avoid motion sickness is ginger. For using ginger to remedy your motion sickness, some people find ginger tablets or ginger gum help with the feeling of nausea caused by being on a cruise ship at sea. Or other ginger remedies like these! When you’re prone to getting sea sick, you may also want to think about extra preparation for shore excursions as well. Just because you’re in port doesn’t mean you won’t be on a moving boat! Some shore excursions involve riding on boats even if “catamaran” or “sailing” isn’t in the title of the shore excursion. For example, if you’re going on a snorkeling excursion in Cozumel, you may take a small boat to get to the best snorkeling spots. Or, if you’re swimming with stingrays in Grand Cayman, you’ll be taking a boat to get to the natural habitat of the stingrays in the middle of the ocean. If you’ll be taking a boat anywhere, it will likely be listed in the shore excursion description, so just be sure to look out for it if you think it might be a concern! More things to maybe pack for your cruise! Now, here are some more things that you just may want to add to your cruise packing list! – Do you need a passport for a cruise?